Big Poppa Eats: Frozen Custard, the Wisconsin way. Frozen Custard, the Wisconsin way. I blinked and it was December. So much to share, so little time. I will try to be brief and prodigious. Quantity over quality if you will. Frozen Custard. Have you had it? It was invented in Coney Island. It is soft serve ice cream's richer, better looking brother. 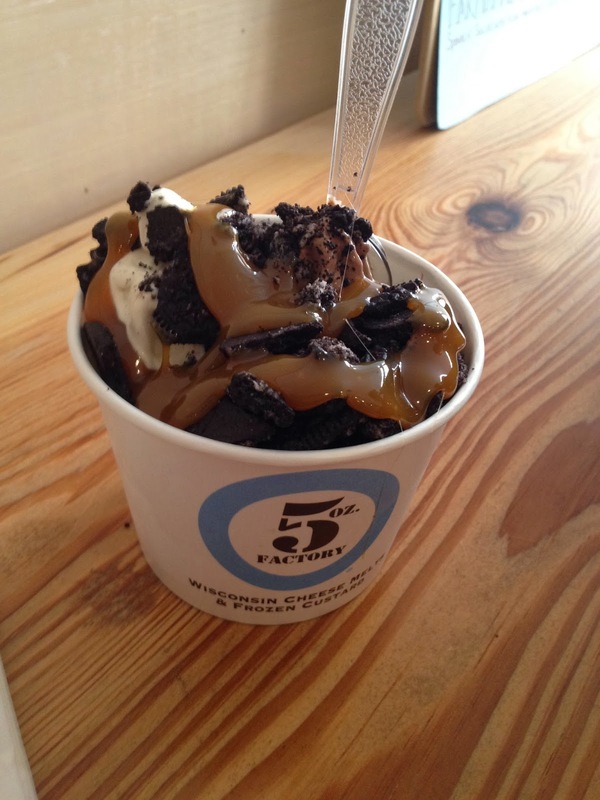 (Don't get me started on the proliferation of crappy frozen yoghurt in this city). What is the difference between frozen custard and soft serve ice cream? Higher milk fat content, higher egg yolk content and less air in the mix. The result is dense, rich and creamy frozen heaven. Why do I bring this up? 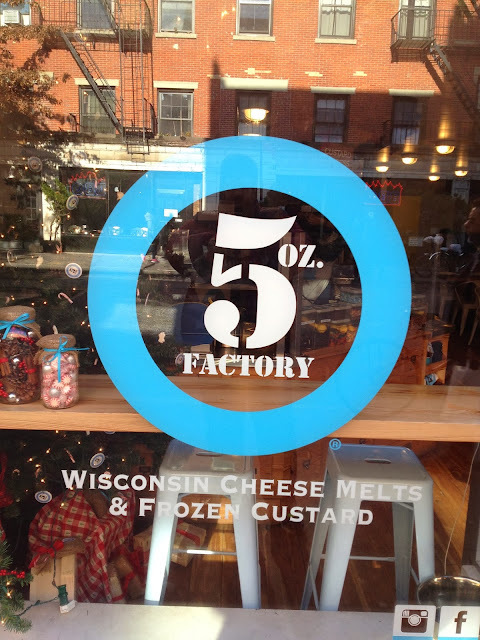 Because some fine folks from Wisconsin (and you don't ever doubt people from Wisconsin on anything dairy related) have opened a lovely spot called 5 oz. Factory on 8th Street. They offer Wisconsin Cheese Melts and Frozen Custard. Today's focus is the custard. The flavors offered are your classics like vanilla, chocolate, caramel and peppermint. The custard is offered in 5 and 10 ounce sizes. They offer 30 or so assorted toppings. I wanted to focus so I went with straight custard. Chocolate and caramel. Becca went for vanilla and chocolate with caramel sauce (smart girl) and crushed Oreos. Wow. Simply, wow (and these were the 5 oz., or small, size). This is flat out fantastic custard. 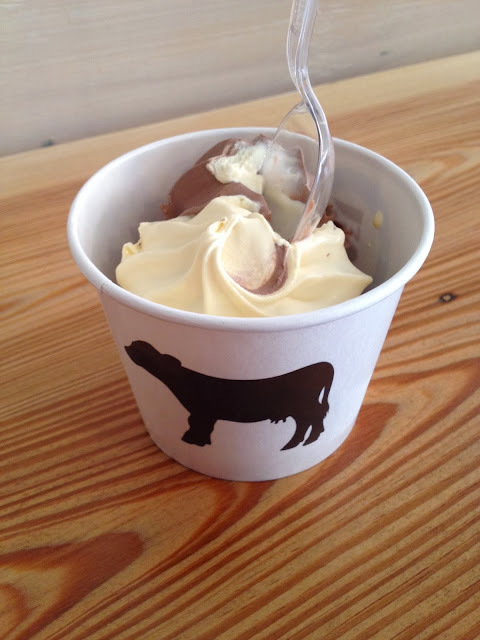 If you love ice cream than you will fall hard for the rich, thick, dense, fresh and delicious custard than at 5 oz. Factory. This will be your spot. End of story. Yeah, it is December. Who cares. It is always a good time for ice cream. It is even a better time when there is frozen custard to be had. Happy Holidays. Wow, that frozen custard looks heavenly delicious! I'm fond of reading food reviews and even wrote my one via http://www.getacademichelp.com/buy-essays-online food travel section. We and my family every weekend are going to spend time visiting our favorite cafe, because it is very useful to eat ice cream together and talk.